Nutrition Strength's Eye Care for Dogs, Daily Vision Supplement with Lutein, Zeaxanthin, Bilberry Antioxidants, Vitamin C and Vitamin E for Healthy Dog Eyes chewable tablets support the nutritional needs of your dogs and their eyes. USING SPECIALLY SELECTED INGREDIENTS WHICH SUPPORT YOUR DOG'S EYESIGHT. SUPPLYING ANTIOXIDANTS FOR DOGS THAT SUPPORT EYE HEALTH. PROVIDING OPTIMAL NUTRITION, WHICH IS NEEDED TO HELP MAINTAIN THE EYE STRUCTURE, ESPECIALLY IN DOGS WITH OCULAR CONDITIONS. SUPPLYING QUALITY INGREDIENTS, INCLUDING LUTEIN AND ZEAXANTHIN, WHICH PROMOTE HEALTHY DOG EYES. DELIVERING VITAMIN C, VITAMIN E and BILBERRY WHICH SUPPORT THE EYE TISSUE. Used daily, our eye vitamins for dogs support overall health in canines and are formulated to promote your pet's long-term active and healthy lifestyle. Our eye supplements for dogs are delivered directly to the stomach for absorption straight into the bloodstream. Suitable for all tastes, Nutrition Strength's premium supplements promote pure and natural eye care, just for dogs. HIGHEST-RATED EYE SUPPLEMENTS FOR DOGS: 365-day guarantee - if you are not happy with our Eye Care for Dogs, Daily Vision Supplement with Lutein, Zeaxanthin, Bilberry Antioxidants, Vitamin C and Vitamin E for Healthy Dog Eyes, simply contact us for a full refund. We want you to be completely satisfied with our eye vitamins for dogs, which support your dog's vision. MOST EFFECTIVE EYE VITAMINS FOR DOGS: Our Eye Care for Dogs provides a complete formula for dogs of all ages to support their good eyesight, for longer. Formulated with essential vitamins, minerals and nutrients, our eye supplements for dogs support the nutritional needs of your dogs and their eyes. 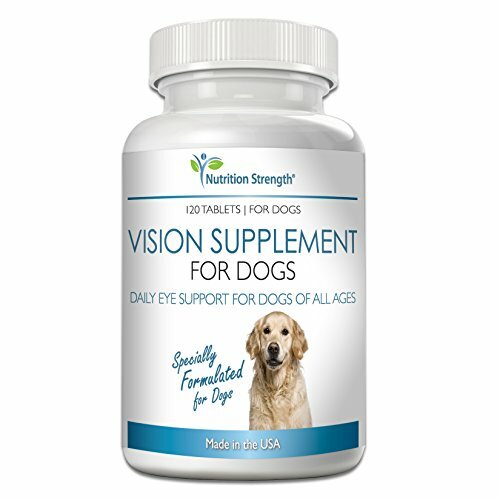 NATURAL SUPPORT FOR DOG EYE PROBLEMS: Nutrition Strength's Eye Care for Dogs, Daily Vision Supplement is made with the highest quality FDA-approved ingredients. Designed to support your dog's vision, our supplement provides antioxidants for dogs for total wellness. Manufactured using the highest standards, our tablets are safe for use with your dog's medications. IDEAL FOR DOGS OF ALL AGES, SHAPES AND SIZES: Nutrition Strength's eye vitamins for dogs with Lutein, Zeaxanthin, Bilberry Antioxidants, Vitamin C and Vitamin E formula is designed for dogs of any breed, age and size. Your four-legged friends will love taking our tasty chewable supplements for dogs daily. It will help keep your pets healthy and happy! Suitable for all tastes. MADE IN THE USA: Nutrition Strength's eye supplements for dogs are made using 100% green, carbon-neutral technology and are 3rd party certified for purity and potency. Our premium supplement for healthy dog eyes meets the strictest animal supplement manufacturing guidelines. If you have any questions about this product by Nutrition Strength, contact us by completing and submitting the form below. If you are looking for a specif part number, please include it with your message.